Hong Kong, 29 January 2016 – foodpanda, Hong Kong’s leading food delivery platform, announced its Valentine’s Day specials of 2016, so everyone can dine in the intimate comfort of their homes with their loved ones and avoid the hustle, rain and crowds of dining out. Customers will be able to pick one of three options dedicated for foodpanda’s users – “Splash Out Luxury” (average HK$400-600 per head), “Deliciously Indulgent” (average HK$200-400 per head) or “Comfortable & Affordable” (HK$80-200 per head) and order on this page: https://www.foodpanda.hk/contents/valentinesday from February 11th. For every order placed on Valentine’s Day (14 February 2016), customers will also receive a Valentine’s Day gift. 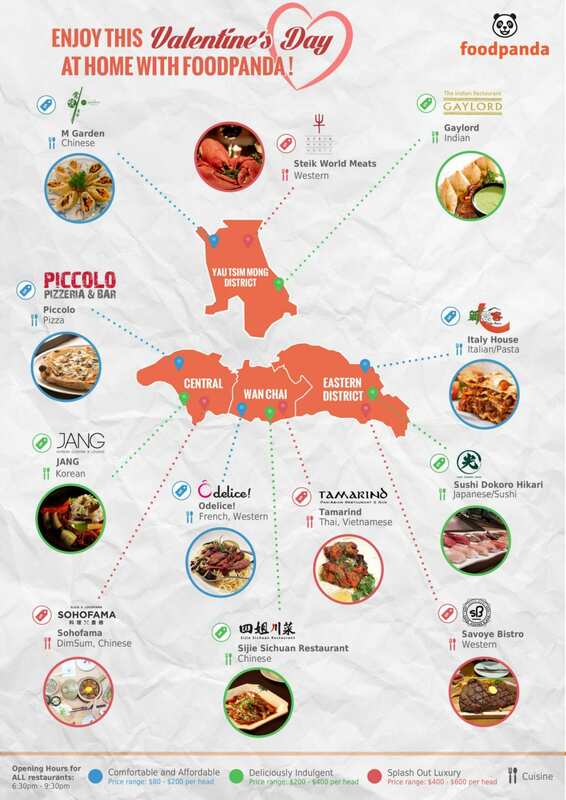 For every order in restaurants recommended by foodpanda on this special day, users will enjoy 15% off; participating districts: Western, Eastern, WanChai and Yau Tsim Mong Districts. Furthermore, in Central, the users will receive a one-of-a-kind stuffed panda bear as a gift. For those who wish to pamper themselves this Valentine’s Day can choose restaurants and recommended dishes in the “Splash Out Luxury” section, which consists of a variety of different high-end restaurants, including Sohofama or Steik World Meat. As for the customers who want to enjoy great food without putting a dent into their wallets, “Comfortable & Affordable” is the choice for them, with delicious restaurants such as M Garden Vegetarian and Italy House. The “Deliciously Indulgent” section includes restaurants such as Sijie Sichuan Restaurant and Sushi Dokoro Hikari, in which users can order large dishes to share. On top of the extensive dishes recommended for Valentine’s Day, users are also able to explore in OpenRice the reviews of those restaurants and to order through OpenRice via foodpanda’s delivery. 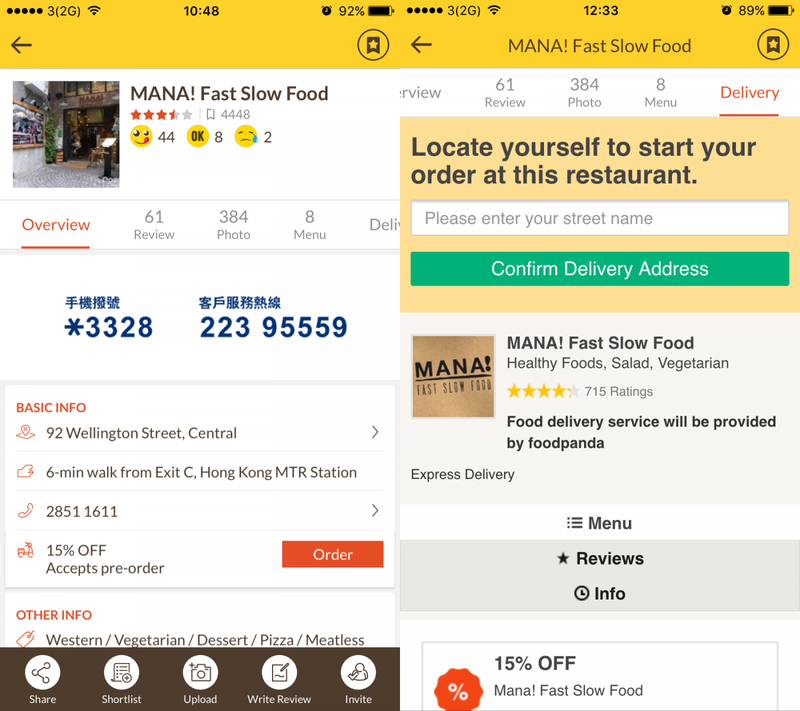 This cross-platform collaboration will benefit Hong Kong users as they will be given the opportunity to order directly from foodpanda’s partnered restaurants via OpenRice’s iOS, Android App or mobile-friendly website. foodpanda is the leading online food delivery marketplace and service provider in Hong Kong. foodpanda operates in 28 countries on four continents. It provides restaurants with an online presence via its marketplace and provides them with an industry leading software and technology to generate additional demand. For consumers, foodpanda offers the convenient home experience of home delivery and the largest selection of top restaurants in the city, from which they can choose their favorite meal via app or online with a few fingertips. Furthermore, foodpanda is able to ensure in-time delivery and quality through proprietary, own “last-mile delivery technology and operations.